​​Please contact us, using the form on the contact page, prior to ordering any art piece to check for availability ​and shipping/handling costs. Thank you! 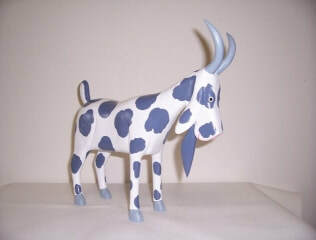 #001 Goat This medium size goat stands approximately 12" t x 13" l. Colors Vary. 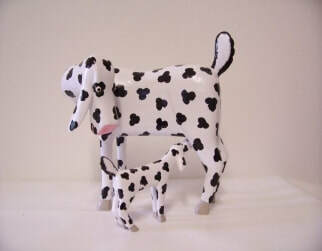 #002 Nursing Baby with Momma Goat Measures approximately 8" x 6" x 10". This is a two piece set. Colors Vary. 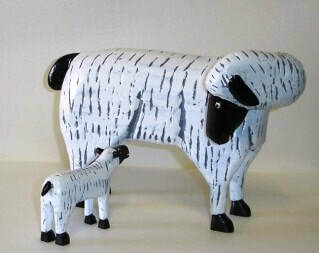 #003 Ewe and Nursing Baby Hand carved and painted. 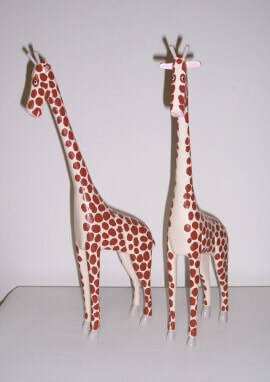 Measures approximately 7" x 6" x 11". 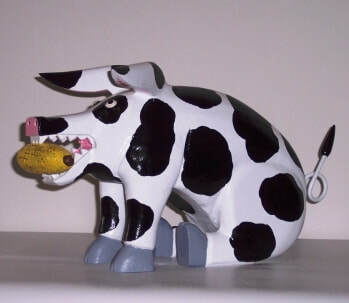 #004 Cow Hand carved from wood and hand painted. Approximately measures 10" x 5" x 8". 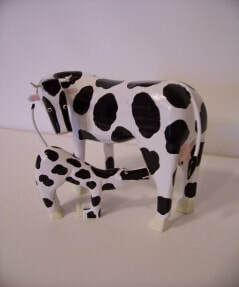 #005 Cow with Nursing Calf This momma cow measures approximately 8" x 7" x 11". 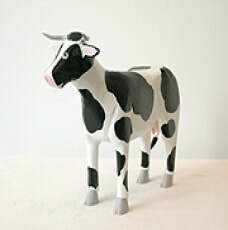 She comes with a small kneeling calf. This is a two piece set. 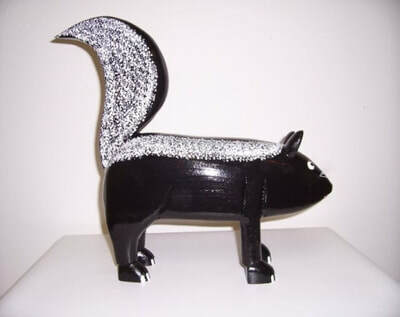 #006 Large Skunk The large skunk is carved from wood and hand painted. 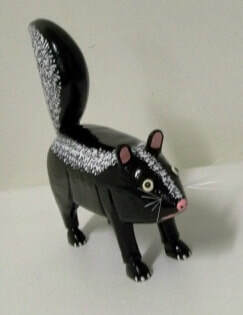 The skunk measures approximately 15" h x 19" w.
#007 Momma Skunk Hand carved and painted. Approximately 7.5" high x 4" wide x 8" long. 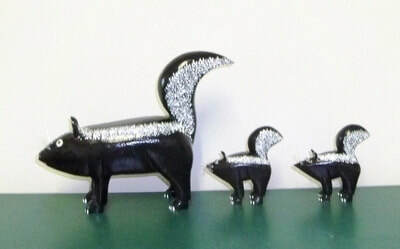 #008 Skunk and Babies The small skunk measures approximately 7.5" h x 4"w x 8" l. The babies measure approximately 4". 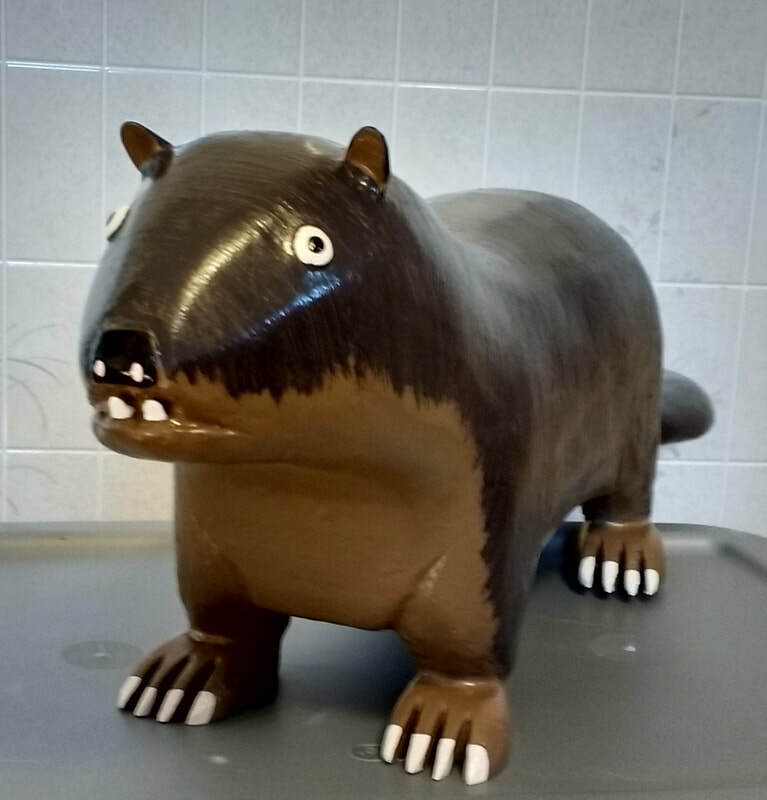 Carved from wood and hand painted. 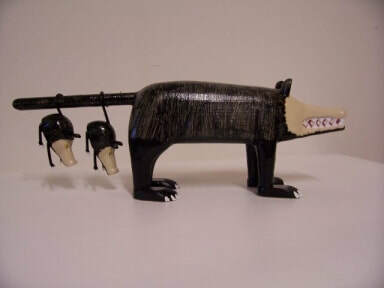 #009 Bear with Fish in Mouth Large Bear with Fish in Mouth measures approximately 9" high x 5" wide x 19" long. 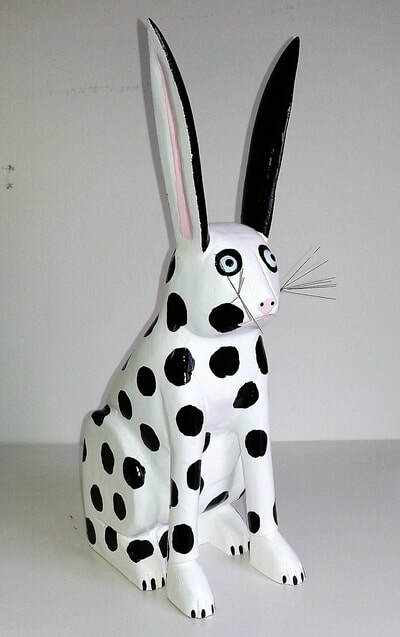 All hand carved and hand painted. Small Bear with Fish measures approximately 8" high x 3" wide x 15" long. 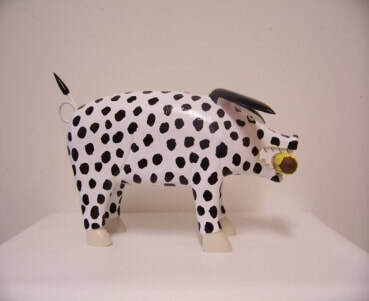 #010 Large Pig The large pig is carved from wood and hand painted. Colors vary. The large sitting/standing pig with corn measures approximately 10" high x 6" wide x 15" long. #011 Large Pig The large pig is carved from wood and handpainted. Colors vary. Approximately 10" high x 6" wide x 15" long. 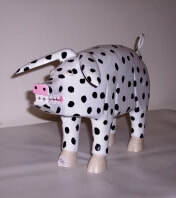 #012 Large Pig without Corn in mouth. 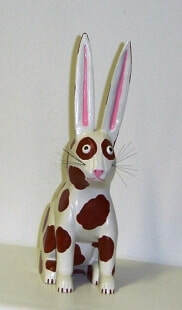 Carved and Hand Painted. Sizes vary. 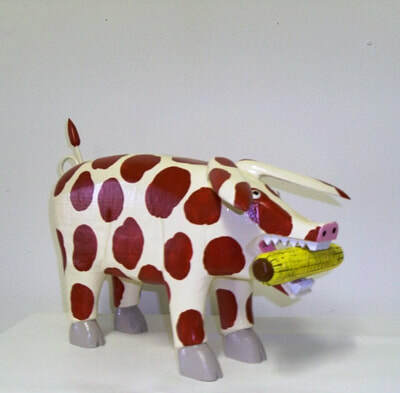 #013 Momma Pig with Corn in Mouth. Hand Carved and Painted. 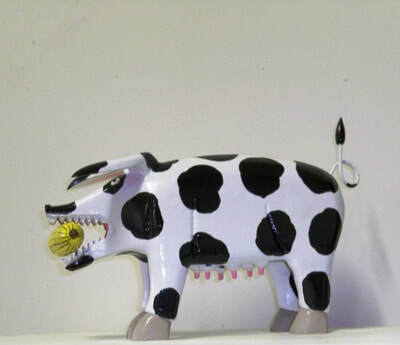 #014 Large Sitting Pig with Corn in Mouth. Hand Carved & Painted. Measures approximately 10" high x 6" wide x 15" long. 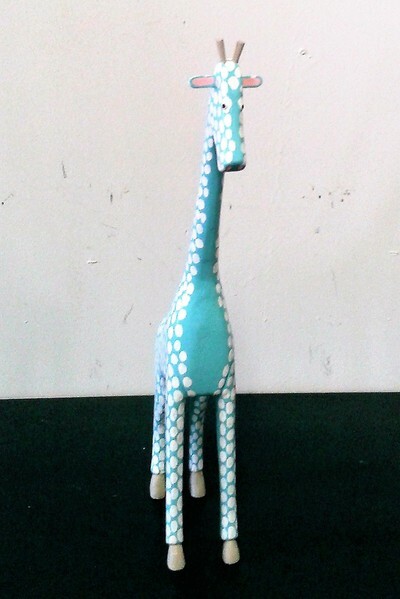 #015 Giraffe Measures approximately 17" high x 3" wide x 8.5" long. Hand carved and painted. 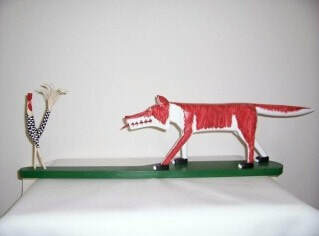 #016 Extra Large Fox with Chicken in Mouth. Approximately measures 44" long x 17" tall. 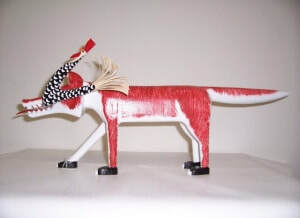 #017 Small Fox with Chicken in Mouth. 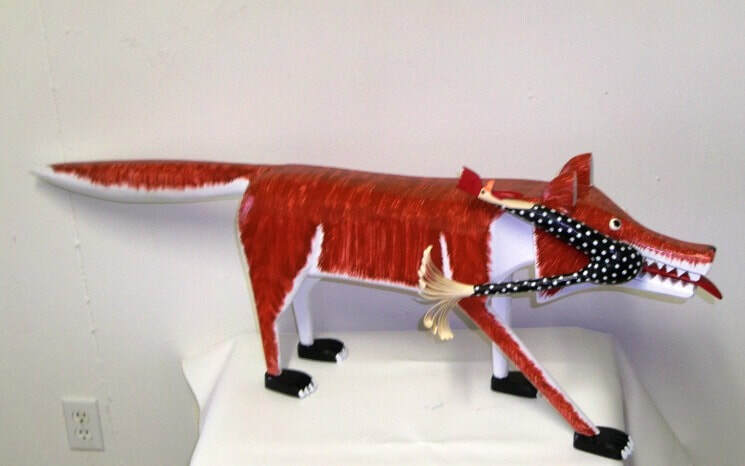 The wooden fox with chicken in mouth measures approximately 22 x 8". #018 Fox Chasing Chicken This wooden fox chasing a chicken measures approximately 28" x 8". #019 Giraffe Measures approximately 17" high x 3" wide x 8.5" long. Hand carved and painted. 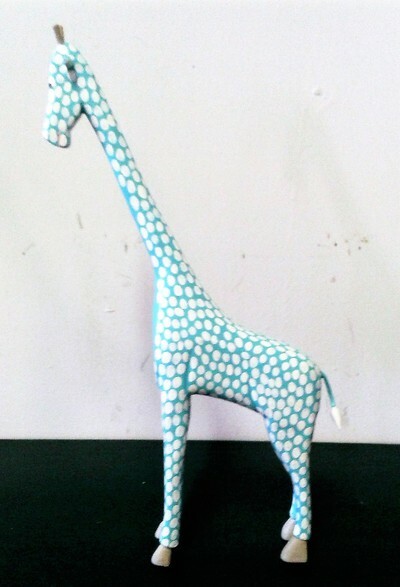 #019 Giraffe Measures approximately 17" high x 3"wide x 8.5" long. Hand carved and painted. #021 Large and Small Rabbits Carved from wood and are hand painted. 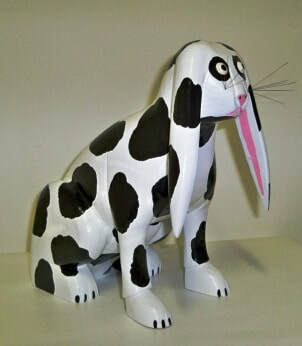 The large rabbit measures approximately 11" h x 19" l. Colors vary. 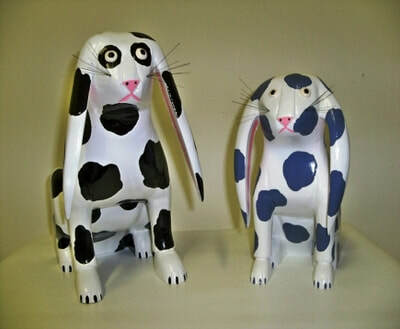 The Small Rabbits measure approximately 10" h x 6" w x 7" l. Colors Vary. Please specify ears up or floppy. 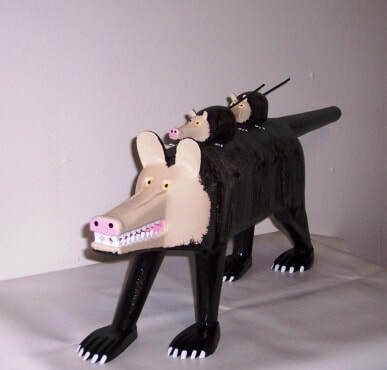 #022 Large Opossum carrying Babies on Back Measures approximately 11" t x 6" w x 29" l.
#023 Opossum with Small Wooden Babies This smaller opossum is carved from wood. 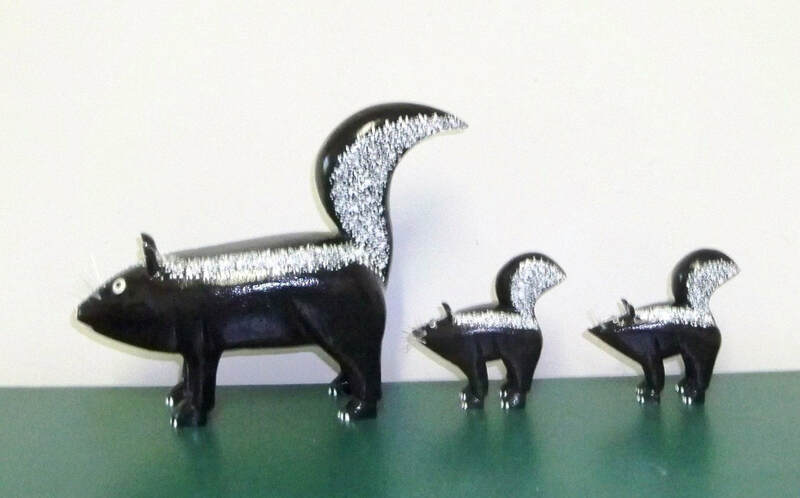 She carries her babies on her tail and measures approximately 5" tall x 14" long.